Known primarily for integrating the University of Mississippi, J. H. Meredith, the son of Moses Arthur “Cap” Meredith and Roxie Patterson Meredith, was born on 25 June 1933 in Kosciusko, Mississippi, in Attala County. He later adopted the names James Howard. Raised a Methodist, he was the sixth of Cap Meredith’s ten children and the first of Roxie’s five. From Meredith’s birth his parents believed that he might bring equality between the races in the United States, which he called his “Divine Responsibility.” Nevertheless Cap Meredith secluded his children in the black community. In a unique position among blacks as the owner of the eighty-four-acre farm on which his family lived, Cap Meredith did not allow his children to visit friends living on white-owned farms or to work for white employers. As a child, J. H. Meredith and all of his siblings worked in the fields when not at school. Cap Meredith shared all of his knowledge with the significant exception of the inferiority complex blacks were supposed to adopt in the presence of whites. In 1936, at the age of three, J. H. began attending Marble Rock School, which his father helped build, and in 1941 the boy continued his education at the Attala County Training School, a four-mile walk each way every day. In 1950 he left Mississippi to live with his uncle in St. Petersburg, Florida, and attend Gibbs High School for his senior year. There he had his first encounters with whites. In 1951 Meredith graduated from high school and followed in the footsteps of his older brother, Leroy, by enlisting in the US Air Force. Meredith trained at Sampson Air Force Base in New York as part of the Air Force’s new integration experiment. For nine years he moved around the United States and Japan on assignment, rising to the rank of staff sergeant and earning five good conduct medals. He attended nearby universities when he could, including the University of Maryland, Washburn University, and the University of Kansas. In December 1956 he married Mary June Wiggins, and their son John Howard was born four years later. Meredith returned to Kosciusko in August 1960, fully intending to wage the war on white supremacy he had planned throughout his Air Force career. He later declared, “My objective was to force the federal government—the Kennedy administration at that time—into a position where they would have to use the United States military force to enforce my rights as a citizen.” James and Mary June Meredith enrolled at Jackson State College, and he attended classes for two years. The day after John F. Kennedy was inaugurated as president, Meredith requested an application from the University of Mississippi, and on 31 January 1961 he applied to enroll. His application was denied based on what he felt was racial discrimination. With the help of Medgar Evers, the head of the Mississippi Branch of the National Association for the Advancement of Colored People, Meredith contacted the organization’s Legal Defense and Educational Fund, which appointed attorney Constance Baker Motley to his case. She and Mississippi lawyer R. Jess Brown filed a lawsuit against the university and eventually won their case in the US 5th Circuit Court of Appeals. Accompanied by federal marshals, Meredith made multiple attempts to enroll at the university but was blocked by Gov. Ross Barnett. Meredith finally entered the campus on the night of 30 September 1962 in the midst of a violent riot that left two people dead. He registered for classes on 1 October. On 18 August 1963 Meredith graduated from the University of Mississippi with a major in political science and minors in French and history. That same day he and his family left Mississippi at the request of the federal government. They spent the next year in Washington, D.C., and traveling around Europe, where Meredith gave public speeches. In 1964 he accepted an invitation to study at the University of Ibadan in Nigeria. He returned to New York City to study law at Columbia University in 1965, the same year his father died. In June 1966 Meredith launched the March against Fear, a planned walk from Memphis, Tennessee, to Jackson, Mississippi, to protest racism in the Mississippi Delta. Two days after leaving Memphis on 5 June, Meredith was shot in Hernando. 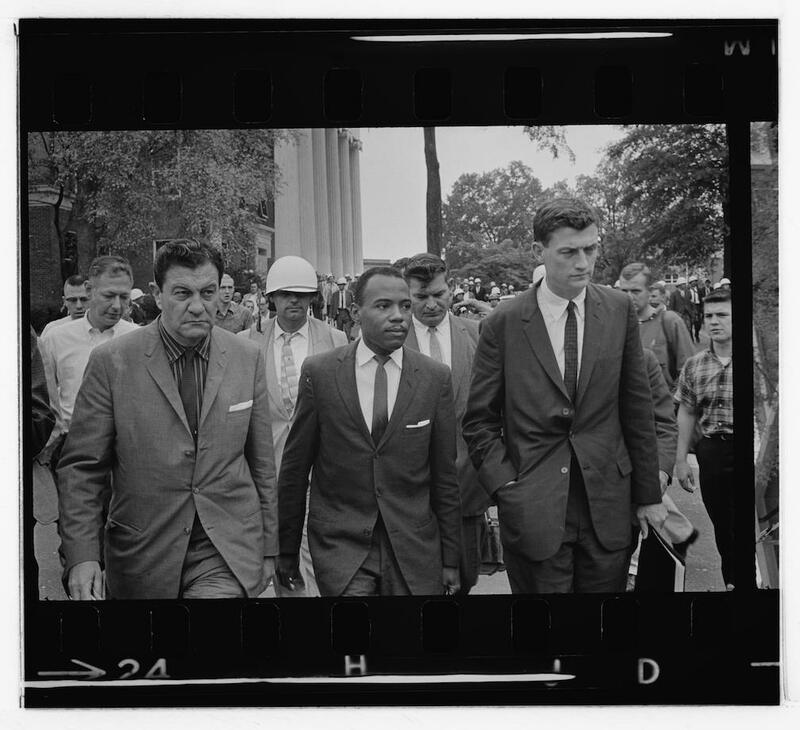 Other civil rights activists took over for Meredith, who recovered and rejoined the march. On 26 June more than fifteen thousand marchers, among them not only Meredith but Dr. Martin Luther King Jr., reached Jackson in what had become the largest civil rights demonstration in the state’s history. Despite Barnett’s attempts to thwart Meredith’s enrollment at the University of Mississippi, he endorsed the former governor in 1967 when he unsuccessfully sought to regain the governorship. Meredith earned a law degree from Columbia University Law School in 1968, at around the same time his wife gave birth to twin sons. Meredith remained in New York City until June 1971, when he returned to Mississippi. He dabbled in various professions, including stockbroker, and ran as a Republican for the Senate in 1972 and for the House of Representatives in 1974. Mary June Meredith died in 1979, and James subsequently married Judy Alsobrooks, who bore him a daughter in 1983. A year later, Meredith accepted a one-year position at the University of Cincinnati. After unsuccessfully running for the board of education in Ohio, Meredith began working for Republican senator Jesse Helms of North Carolina in Washington, D.C., in 1989. Meredith returned to Mississippi in 1991 and subsequently made two unsuccessful bids for Congress. He also published numerous books and continued to run for political office, give public speeches, and establish programs to further black education. He has maintained that he worked for equality for all Americans rather than for the civil rights movement, saying “Nothing could be more insulting to me than the concept of civil rights. It means perpetual second-class citizenship for me and my kind.” Despite declaring that he did not want to be remembered for his role in integrating the university, he participated in commemorations of the fortieth anniversary of his admission. And exactly four years later, the university unveiled a commemorative statue depicting Meredith walking through the door of higher education. He and his wife continue to live in Jackson.